James Neiss/staff photographerNiagara Falls, NY - Katie Trombley, Community Missions public relations & development manager, left, presents little Rolanna Payne, 3, with a Christmas gift. Rolanna came to Community Missions with her sister Roliza Payne, 8 mos. 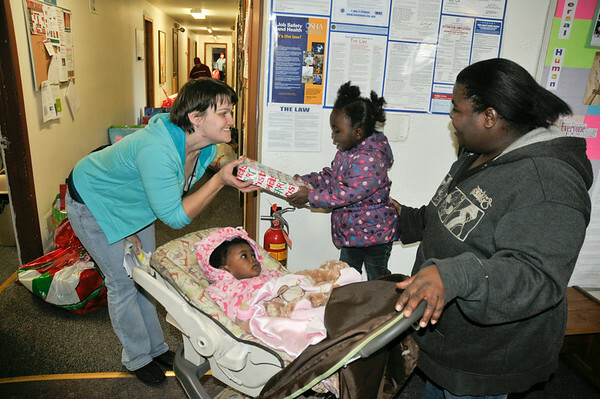 and her mother Lisa Boston, to pick up gifts and food as part of the Mission’s Adop-A-Family program. Individuals and business sponsored specific individual families and purchased gifts for them. At the time of the photo over 160 families were adopted and Trombley expects that number to rise as Christmas nears, she said.